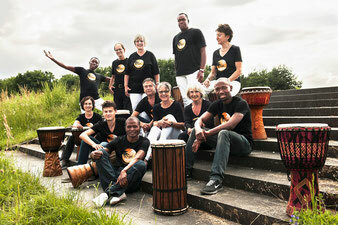 Who we are - get-together-drumgroups Webseite! daily routine was only, phone, eat and sleep. One day i woke up with a good mood and decided to make a change. I started this day with 10euros, and went to buy boot cans of beer, red bull and building shakers. They were my first instruments here, and i began playing music with people in the camp with different nationalities and culture. After getting a big hope after the cans, i make flyers and start to invite the neighbours of my refugee camp to play every week together. Seeing how great it developed, makes me very happy and i feel proud! And it proofs once again, that if you really believe in something and give everything you´ve got to reach your goals, it´s possible in whatever kind of situation you´re in the moment. This is us, the group. We are totaly mixed ages, heritage and professions. 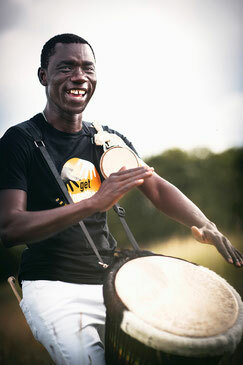 But there is one thing uniting us, the drumgroup. We feel like a big family. We are about 14 member in the group for now. Addional to Youssou there are 3 more refugees, coming from Nigeria and Kongo as constant members of our group. We are always looking for new members. If you are interested please get in touch with us.